As you might imagine, VR is going to be an expensive hobby. Once you’ve had kids, you can’t help but see the Virtuix Omni as one of those baby bouncer activity centers, just for adults. What the Omni actually is, of course, is an extremely realistic virtual-reality harness that debuted about two years ago. 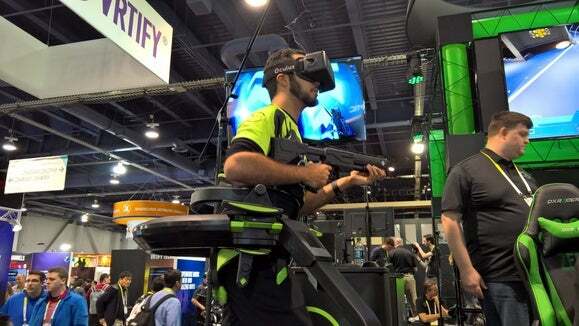 At the time, Virtuix was charging about $400 for the setup in 2013, when the device was in the prototype stage. Now, as a full-fledged commercial product, the price has gone up to $699, according to Chris Shelton, the head of sales and marketing for the company. The setup remains largely unchanged: $699 buys you a pair of slippery shoes (in your size, of course) which slide smoothly over the concave bowl that is the “floor” of the Omni. The idea is that as you run (or “moonwalk,” really) in real life, you remain in place but your strides are measured as movement by the game itself: you can run, sidestep, or move backwards. Virtuix recently asked a player to “run” across the Wasteland of Fallout 4; it took 20 minutes, he said. The rest of the price covers the frame of the Omni system and a safety harness. According to Shelton, the Omni can accommodate users from about 5 feet in height to 6 feet, 5 inches. The base supports up to 285 pounds. You’ll have to supply your own head display, however, such as the Oculus Rift or HTC Vive, as well as some form of gun or other controller. Although I didn’t play the Omni itself, Hayden Dingman has—and he says it’s amazing. Otherwise, the Omni drew excited crowds during E3 as combatants staged miniature tournaments that lasted a few minutes each. As virtual reality becomes more mainstream, consumers are going to begin asking for more lifelike physical experiences to complement the virtual one—and the Virtuix Omni appears to be on the right path.